Joe Cook, left, the incumbent, is running against Theresa “Terry” Chapman, center, for a two-year position on the Dummerston Selectboard. Hugh Worden is running unopposed for a three-year Selectboard seat. Dummerston’s Town Meeting will be held on Tuesday, March 1, at the Dummerston Elementary School. The school meeting will begin at 10 a.m., with the town’s portion to follow. Election polls will be open from 8 a.m. to 7 p.m.
DUMMERSTON—On a recent unseasonably warm Wednesday night, a handful of Dummerstonians braved the fog to sit in the basement of the Congregational Church. Although plenty of pies have entered into this world through that basement, this was not a snack event, much to the dismay of at least one attendee. Instead, residents were gathered together to meet some of their candidates for public office. At 6 p.m. sharp, Selectboard Chair Zeke Goodband began the proceedings by welcoming attendees, introducing the candidates, and laying down the law. “If you have a long oration,” he told the audience, “then you should have been a candidate, so confine it to the questions themselves." During the Q-and-As, residents followed suit, asking thoughtful and fairly brief queries of their prospective officeholders. The first portion — for those running for the School Board — was arguably the liveliest. Nearly every question directed toward Christian Avard, Kristina Naylor, and Amy Wall, was about the state’s new school governance bill. Charles Fish asked the trio point-blank if any of them would “speak out forcefully against Act 46.” Fish wanted the know if the candidates were for or against what he characterized as a “pernicious” law. Although none of the three stood firmly on one side or the other, they all spoke about needing more information from the state. Avard, incumbent, mentioned the frustration with having to decide so quickly on a bill he described as “rushed." 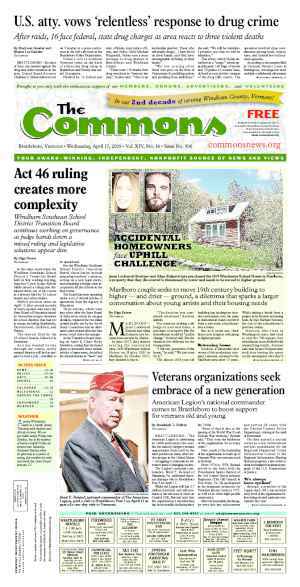 Good legislation “doesn’t get all cramped together and passed,” Avard said, noting, “we’re all under a lot of pressure” to decide and “it just doesn’t feel right." Naylor, who is running with Avard for the two open one-year positions, said she wanted to conduct a careful study before deciding which of the merger options she would support. She attributed her process to her professional background. “I’m a scientist by training — I should warn you,” Naylor said. Wall, who is running unopposed for the three-year School Board position and has served on the board for 12 years, said that navigating the intricacies of Act 46 is “like shooting at a moving target." Next up in the evening’s proceedings was the Town Offices segment, where residents heard the candidates for town moderator, town clerk, treasurer, and lister introduce themselves. Cindy Jerome, who said she sat on the selectboard seven years ago, offered her experience running the Holton and Bradley Homes as good reasons why she will serve the town well as moderator. As for why she wants that office in particular, Jerome joked, “I only have to work one day a year." Dummerston’s current Treasurer and former Assistant Town Clerk, Laurie Frechette, briefly listed her many years of experience working in the town offices to explain why she is a good candidate for Town Clerk. “It’s a great opportunity to switch gears,” she said, noting the new gig will allow her to “add another hat to my wardrobe." Charlotte Neer Annis credited “the opportunity for a new challenge,” and her strong interest and skills in mathematics as prime reasons why she is running for Treasurer. Annis, who has served the town for seven years in the zoning and listers’ offices, said she will bring a “smooth transition” to the job because she is familiar with how the office operates, especially during tax time. Although Douglas Hamilton said he initially was not going to seek reelection to the three-year lister position after 24 years of service — because, he said, “I’m not 24 years old anymore” — he reconsidered. In the next three years, Hamilton said, Dummerston “is going to be faced with a reappraisal,” and he wants “to be a part of that." After the four gave their stump speeches, Goodband noted each position is uncontested, “so if they lose, they’ll feel really bad." Last up was the selectboard segment. Three candidates are vying for two vacant seats. Joe Cook, the incumbent, is running against Theresa “Terry” Chapman, for the two-year position. Hugh Worden, unopposed, seeks the three-year seat. Worden introduced himself first, noting he grew up in Dummerston. He mentioned his many years of service in the U.S. Marines Corps, and said he “always had an interest working with and serving the town.” Although he has already done so — Worden is on the Cemetery Committee, and was Chair and Vice-Chair of the Development Review Board — he said he now seeks a Selectboard seat because his life offers the necessary flexibility. “If we have the time, we have a responsibility to give back to the town,” Worden said. Terry Chapman, who earned a degree in criminal justice and law enforcement, said she was raised in Williamsville, and has lived in Dummerston for 26 years. She said she is “very interested in town government,” and noted she currently serves on the Cemetery Committee. This position, Chapman said, gave her a great opportunity to learn about many of the town’s residents. Her year spent as auditor provided insight to the financial aspects of municipal governance, she said. Dummerston “is a great town to live in,” Chapman said, and she wants it to be “more affordable” so others can live and retire there. 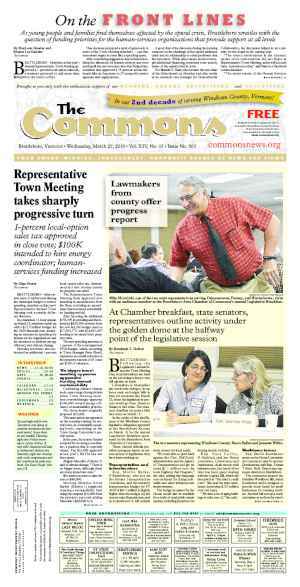 Chapman said that, should she get elected, she plans to “take advantage of as many [workshops] as she can” on municipal governance, such as those given by the Vermont League of Cities and Towns. Although Joe Cook is the only candidate who may lose his seat, noting his and Chapman’s is “the only contested election,” he called for more competition for public office, not less. “It would be great if we had more” people running for election, Cook said. 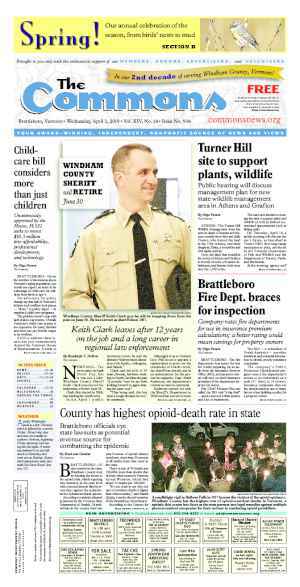 Cook, who has served for three years on the selectboard, listed his other former leadership roles in the community, including Chair of the Brattleboro Union High School board. He also mentioned his previous job, prior to becoming a lawyer, as investment banker, noting his experience will help serve the town in financial matters. 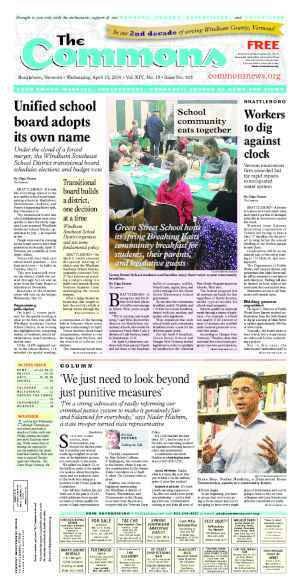 Budget season, Cook said, “is where the Selectboard gets into action." When Harold Newell asked Cook for an example of an “outstanding accomplishment on the Selectboard,” he said that a lot of his shining moments were behind the scenes, on a “Selectboard in transition." But, he mentioned his role moderating a “difficult discussion” on the firing range in West Dummerston. Cook said he is happy with the way the board has worked together. “Conversations are always cordial and respectful,” he said, and “with your support, I’d like to continue to serve." Originally published in The Commons issue #344 (Wednesday, February 17, 2016). This story appeared on page C1.